Zucchini is the star of this lasagna recipe, adding a unique texture and flavour. Not to worry - there are still the familiar layers of noodles, meat sauce and creamy ricotta. 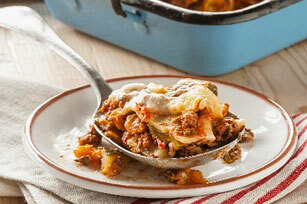 Try this lasagna recipe tonight or make it ahead and freeze for later. Cook beef, onion and green pepper in large skillet sprayed with cooking spray on medium-high heat 4 to 5 min. or until onions are softened and beef is brown. Add pasta sauce; mix well. Simmer on medium-low heat for 20 min. or until thickened, stirring occasionally. Meanwhile, stir together egg and ricotta in small bowl. Spread 1/4 of the meat sauce into bottom of 13x9-inch baking dish sprayed with cooking spray. Layer 3 lasagna noodles, 1/3 of the zucchini slices, 1/3 of the ricotta mixture and 1/4 of the meat sauce. Repeat layers 2 times, finishing with remaining noodles. Cover with foil and bake 35 to 40 min. Top with Parmesan and mozzarella; cook uncovered 10 min. or until cheese is lightly browned. For the perfect make-ahead dish, prepare two lasagnas; bake and serve one now, and cover and freeze other for later use. This recipe lends itself well to the addition of herbs. Make it your own by adding 1 Tbsp. chopped fresh parsley, basil or oregano.